Hunsonby is a civil parish in the Eden District, Cumbria 7 miles (11 km) north east of Penrith. 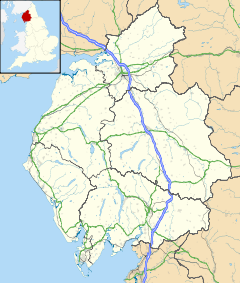 The parish is located 28 miles from the city of Carlisle. Within the parish is the ancient stone circle of Long Meg and Her Daughters but not the nearby standing stone of Little Meg which is located near Langwathby. In 2011 the Census reported the parish to have a total population of 388, with 198 males and 192 females. The civil parish of Hunsonby was formed in 1934 from a merger of the two parishes of Hunsonby and Winskill; and Little Salkeld, which were formed in 1866 out of the ecclesiastical and former civil parish of Addingham. Historical Map on Hunsonby, published in 1945 by Ordnance Survey of Great Britain. Hunsonby is 11,397.593m² in area, with an area of 33.22m² used for domestic buildings. The only place of worship is an old Wesleyan Methodist chapel, which opened in 1862 but was closed in 2001. Over time, there hasn't been a massive change in Hunsonby's population density. Between 1881 and 1921, the population fluctuates marginally, but stays reasonably the same. In 1931, the population gradually starts to increase, reaching 371 residents in 1951. The following decade, the population then reaches 435 residents. However, in 2001 the population then decreases again, and the most recent data recorded shows Hunsonby with a population of 388 people. Occupations of Residents in Hunsonby, According to the 1881 Census. Shows both sexes. According to the 1881 census, the occupation sector that employed the most residents and the most males was agriculture. For the majority of the female residents, their occupation was unknown, or not specified. Those whose occupation was specified, they worked in the Domestic service and office sector. The 2011 census revealed that still the biggest majority of workers are employed in the agriculture sector, matching Hunsonby's history. However, the second highest occupational group was managerial and Professional sector, showing a real shift in the occupations the last two centuries. The A686 is the main road located near Hunsonby, which is the main route to the market town of Penrith. The nearest train station is in Langwathby. ^ "Hunsonby (Parish): Key Figures for 2011 Census: Key Statistics". Office for National Statistics. Archived from the original on 2 April 2015. Retrieved 1 April 2015. ^ "Office for National Statistics". Archived from the original on 4 March 2016. Retrieved 26 April 2015. ^ Wilson, John Marius (1870–72). Imperial Gazetteer of England and Wales. Edinburgh: A. Fullerton & Co. Retrieved 17 March 2015. ^ "Relationships and changes Hunsonby CP through time". Vision of Britain. Retrieved 25 November 2018. ^ "Key Figures for Physical Environment". Office for National Statistics. Archived from the original on 4 March 2016. Retrieved 26 April 2015. ^ Gray, Lydia. "Hunsonby Wesleyan Methodist Chapel". My Wesleyan Methodist Ancestor. Retrieved 24 April 2015. ^ "Hunsonby Population Data". Vision of Britain. Retrieved 25 April 2015. ^ "Population Density, 2011 (QS102EW)". Office for National Statistics. Archived from the original on 4 March 2016. Retrieved 25 April 2015. ^ "Occupation (Minor Groups)". Office for National Statistics. Archived from the original on 26 April 2015. Retrieved 26 April 2015. This page was last edited on 6 December 2018, at 00:40 (UTC).